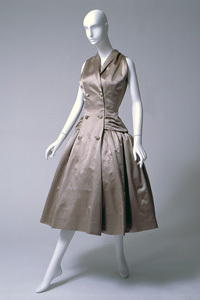 Christian Dior, dress in satin, 1954, France, gift of Sally Cary Iselin. You’ve probably been too busy looking for electrical outlets below 34th Street to have noticed that today is the last day of the exhibition Fashion, A-Z: Highlights from the Collection of the Museum at FIT, Part Two. Don’t worry, because as your power (and Internet) comes back on, you can get your fashion fix via FIT’s new digital archive that lets you surf by alphabet to see all the famous designers and dresses that are in the collection. Search by designer or brand, they’re all there. The gallery show has the outfits arranged A (for Adrian with a MoMA-inspired creation) to Z (Zoran) in its upstairs gallery. The curators often placed two designer ensembles side-by-side, emphasizing the original designer (for example, Dior) and the younger designer who took over creative duties for the house over time (for example, YSL for Dior). It’s a treat to see side-by-side examples of new and old Hermes (featuring Gaultier vs. the Kelly bag), Valentino, Balmain, Kenzo, YSL, Dior, and Comme des Garcon creatives. 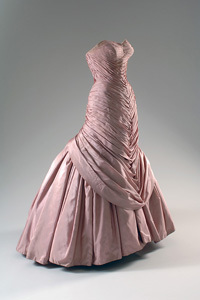 Charles James, evening dress in silk taffeta and net, 1955, USA, gift of Robert Wells In Memory of Lisa Kirk. Is Charles James still the reigning world champion? Take a trip to Seventh Avenue today or start surfing fashion history to make your own determination. This entry was posted in Art, Fashion, History, Museums and tagged art, culture, design, fashion, history, museums, textiles by mssusanb. Bookmark the permalink.